Anna’s mother “Anna” died the day after she was born, Her father “John” died 8 years later. 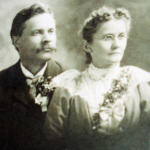 Wife of Dr. Michael R. Miley, married October 14, 1899. 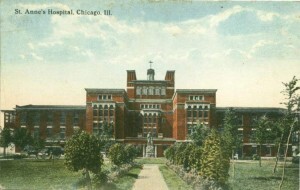 Mrs. Anna Miley, 83 years old, Beecher, died Saturday afternoon at St. Anne’s Hospital, Chicago. Final rites will be at 2:30 p.m. today at Hack Chapel, with the Rev. E.H. Plassman officiating. Interment will be at Beecher Mausoleum. 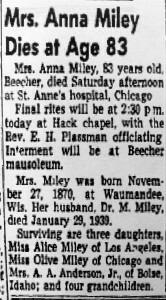 Mrs. Miley was born November 27, 1870 at Waumandee, Wisconsin. 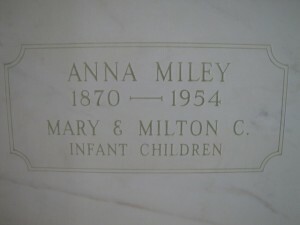 Her husband, Dr. M. Miley, died January 29, 1939. Surviving are three daughters, Miss Alice Miley of Los Angeles, Miss Olive Miley of Chicago and Mrs. A. A. Anderson, Jr. of Boise, Idaho; and four grandchildren. Death came quietly to Mrs. Anna Miley, 83, at St. Anne’s Hospital, Chicago, Saturday afternoon, August 21, following several months of ill health due to her advanced age. Mrs. Miley was born November 27, 1870 in Waumandee, Wisconsin. The widow of the late Dr. M. Miley, who died January 29, 1939, her life was closely associated with the early-day history of Beecher in her roll as “doctor’s wife.” She continued to maintain her home here up until the time of her death, spending her time here when health permitted and with her daughter, Olive, at Chicago. 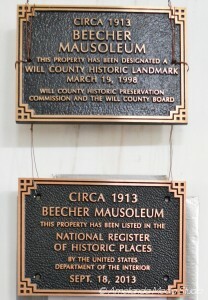 Mrs. Miley lived in Beecher about 54 years. Funeral services were held on Tuesday afternoon, at 2:30 o’clock at the Hack Chapel with burial in the Beecher Mausoleum. Rev. E. H. Plassmand of Peotone officiated. Surviving are three daughters, Miss Alice Miley of Los Angeles, California; Miss Olive Miley of Chicago; and Mrs. A.A. Anderson, Jr., of Boise, Idaho; and four grandchildren. She was preceded in death by her husband and two children in infancy. Can you help us locate any of Dr. Miley’s and Anna’s living descendants? We know their daughter Bernice, Mrs. Albert Allen Anderson of Boise, Idaho, had four children. One of her children, Kathleen K. Anderson, was born May 24, 1939 and died July 3, 2007. Albert, Bernice and Kathleen are all buried at Morris Hill Cemetery in Boise, Idaho. 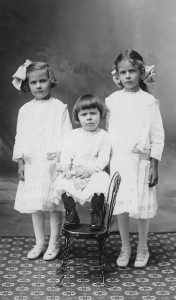 Three more Anderson children were born after 1940, but we can’t identify or locate them. We would love to share their grandparents’ information if we can find them. 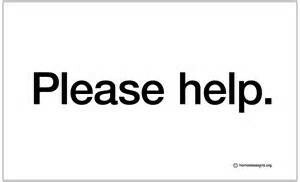 This entry was posted in Automated Burial Listing, Burial Listing, Burial Location, HEADSTONE, Obituary very limited by Sandra. Bookmark the permalink.